With no end of breath-taking scenery, it’s easy to see why much of the hit TV series, Game of Thrones was filmed in Northern Ireland. So, whether you want to send a parcel to one of the iconic filming locations, to the colourful capital of Belfast or to fun-filled Derry, you can trust us to get your parcel to Northern Ireland quickly and without any hassle. Whatever you’re posting to Northern Ireland, at DPD Local Online we’ll make arranging your parcel post as easy as possible. Trusted by millions of senders across the UK and Europe, our easy-to-use website will allow you to research our express and economy courier delivery services, helping you to book postage to Northern Ireland that meets both your timescales and your budget. With DPD Local Online you can be certain that your parcel delivery is in the very best hands. If you want market-leading courier delivery at affordable prices, arrange your postage to Northern Ireland with DPD Local Online today. Do I need to deal with customs when sending from the UK to Northern Ireland? Northern Ireland is not only part of Europe, but also of the United Kingdom, which means you won’t need to worry about customs duties when sending there from England or Scotland. How much does it cost to send a parcel from the UK to Northern Ireland? Shipping to Northern Ireland can cost as low as £14.99 by booking your delivery through DPDLocal-Online. And you could save even more with our Lowest Price Guarantee, which ensures that in the unlikely event you find a price that’s better than ours, we’ll match it! How should I address my parcel for delivery to Northern Ireland? 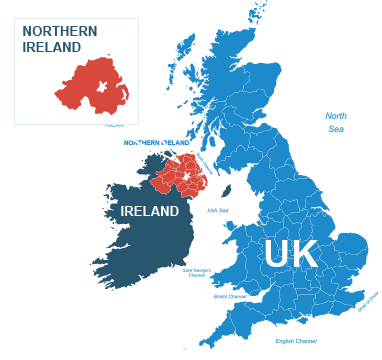 Northern Ireland falls under the addressing system of the United Kingdom. If you need a quick refresher, you can use this addressing guide for the UK published by the Universal Postal Union. For a list of goods that can’t be sent within the UK, check out our .